If you’re renting your property, don’t have enough space for a full size greenhouse, or just don’t feel like breaking the bank then this is for you! 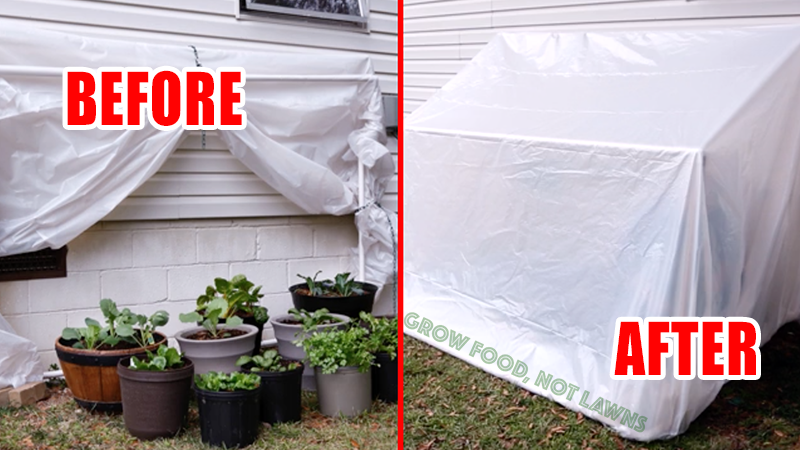 This simple yet phenomenally functional fold-down greenhouse quickly and easily folds down to protect your plants during early frosts and cold snaps. When it’s a bit warmer out you can raise the fold-down greenhouse in a brief moment to provide full sun and rain. To get started you need some PVC pipe and plastic, both of which can be found for cheap at most hardware stores. This design is much sturdier than you might think and is perfect for a variety of climates. Make sure to choose a spot that gets at least 6 hours of sun per day, then build it in a single afternoon to protect your plants all season long! If you pick a partially shady spot you will want to check out this article about 40 edible plants that grow in the shade. Thanks to Bonnie Plants for putting these plans together. Click here to download or print the instructions. This article appeared first at Real Farmacy – Like on Facebook!